I find it simultaneously strange and wonderful that I’m writing a recipe for the dish that single handedly made me loath pasta. As a younger man I once graced the hallowed halls of an institution who’s culinary aspirations were not what I’d call astronomical. I’m sure some of you may have fond memories of your school days, but my final years of high school were spent confined to a boarding school who’s idea of catering was to open a large can of something mysterious and pour it over toast. The list of things that boarding school food turned me off was actually fairly extensive. Among them, steak diane, ham steaks with pineapple, lasagne, meat pies, hot dogs, and pretty much all forms of vegetable. There was very little that the lovely ladies in the kitchen could not make taste disgusting and industrial. I’m quite surprised I developed any kind of food obsession at all after doing my time there. The carbonara of course was on it’s own existential plane of badness. A thin, watery, creamy sauce, with stodgy pasta and either thick chunks of mostly raw mushroom or a slurry of mushroom goo (depending on whether you were the first or last table to get your food). The older and wiser would pick out the bacon and chicken (or whichever meat they’d decided to add), and leave the rest, and then intimidate the young and new into handing over theirs. It should come as not too much of a surprise then that it’s not the first thing I’d ever order on a menu at my local Italian restaurant. But then as is often the case, it seems I’ve had carbonara wrong all these years, and it took Mr Vincenzo Velletri to set me straight. 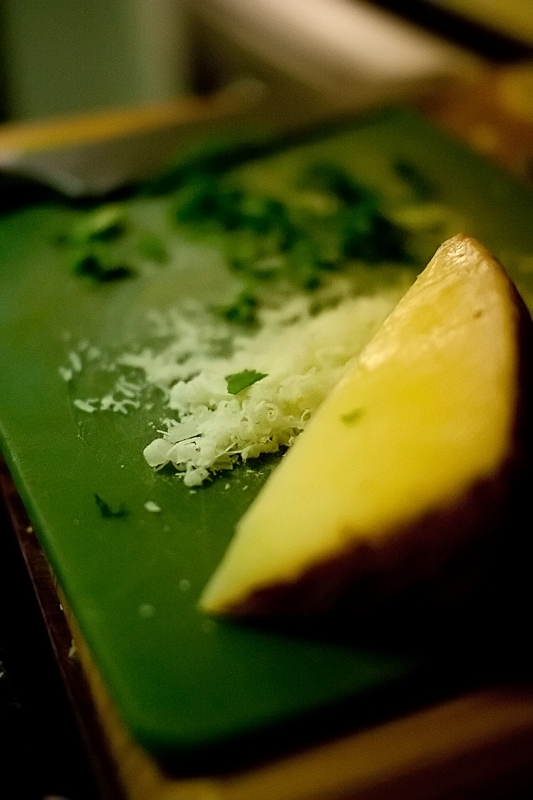 Vincenzo is a man who’s love of food and his Italian heritage knows no bounds. A chef, caterer, butcher, and educator. It was after talking to Vincenzo at a Slow Food Perth event that I realised he had in his possession some very special cured meat, namely Guanciale, that he’d made himself from a friends pigs. Never having heard of Guanciale before I did what any good food nerd does, and headed to the internet for enlightenment. Soon discovering that it’s the meat that should be used in a traditional carbonara. My investigations into carbonara then led me to the shocking revelation that the traditional recipe contains no cream, mushroom, or watery goop whatsoever ! Amazing ! Armed with new knowledge and a hefty chunk of cured meat, it was time to reinvent my taste buds. Now I know this is going to be annoying to the majority of the world, but the simple fact is that Guanciale is hard to find. Unless you have a great traditional Italian butcher or know someone who makes it, then your chances of stumbling across it in a shop are relatively slim. It’s a particularly fatty piece of meat, and is actually the pigs cheek which has been cured in salt, pepper, and chilli for a few weeks. All I can say is that is gives the dish an intensity that you don’t get with just bacon. 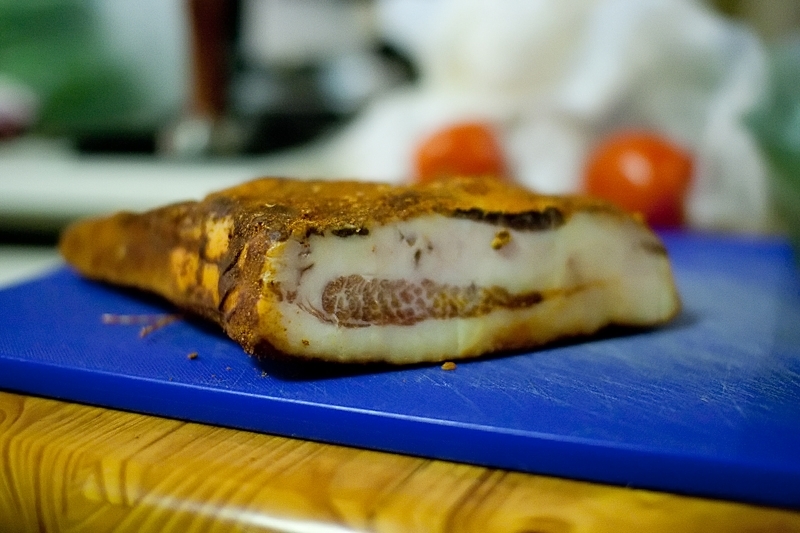 Pancetta (being cured pork belly) is probably the closest thing you’ll find to use as a substitute. 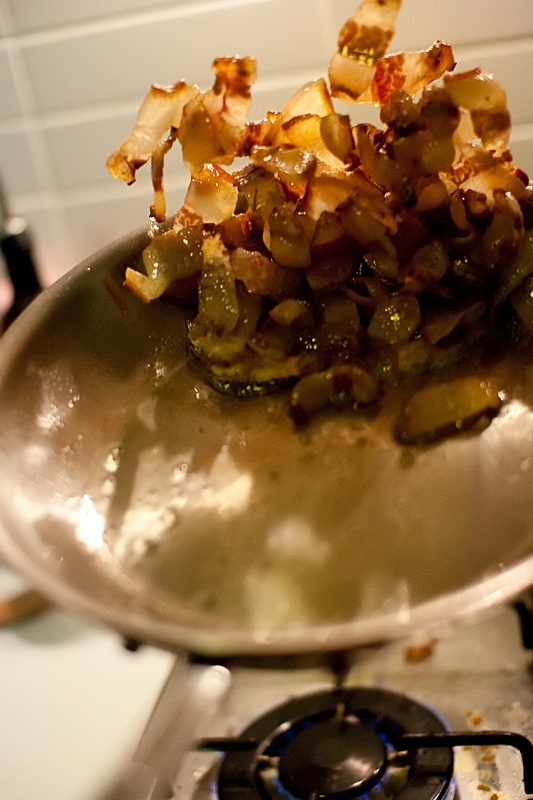 So firstly slice your meat up into small pieces, mince the garlic and fry it in a hot pan with olive oil until it’s soft, then add the meat and fry them together. 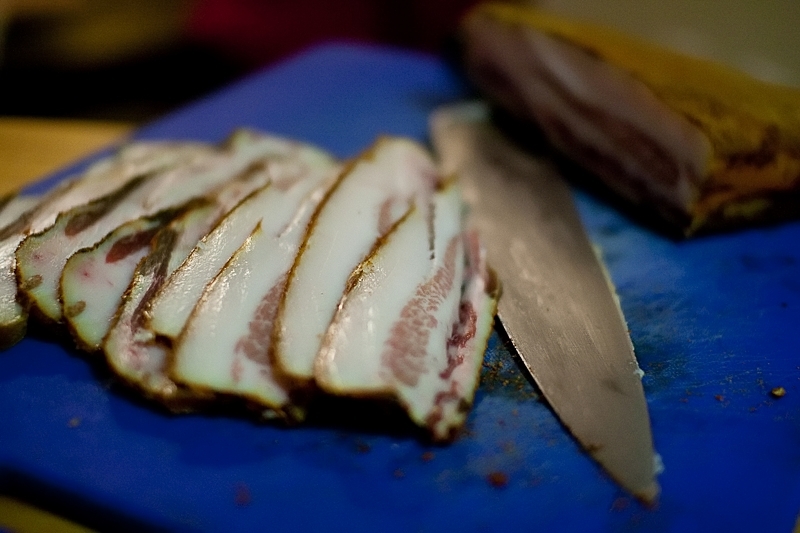 The fat will start to come out of the guanciale, and create a lovely slick. Put your pasta into a pot with plenty of salt and boil it til it’s al dente (or a little before, because it’ll continue to cook once it comes out of the water). 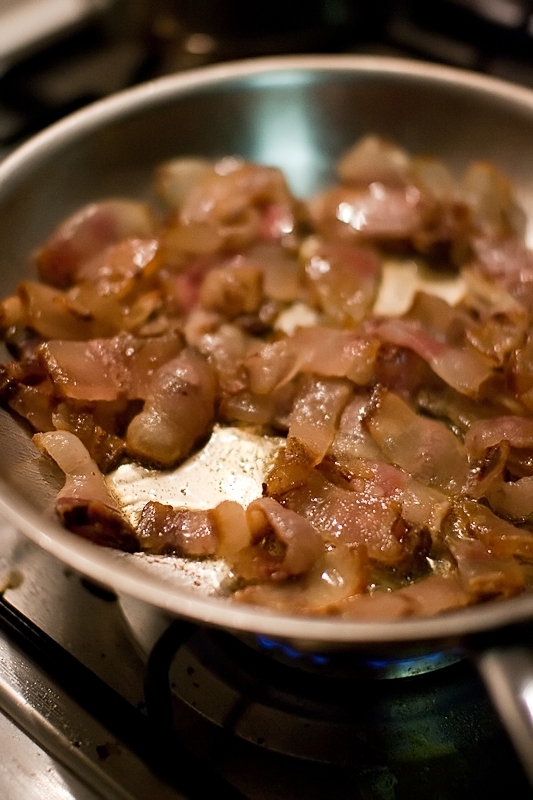 Once the pasta is done, drain it well and then add it to the pan with the guanciale, tossing it well. Now comes the magic. Crack the eggs and mix them together with the cheese, take the pan completely off the heat and then pour the eggs into the pasta, stirring constantly to combine it. 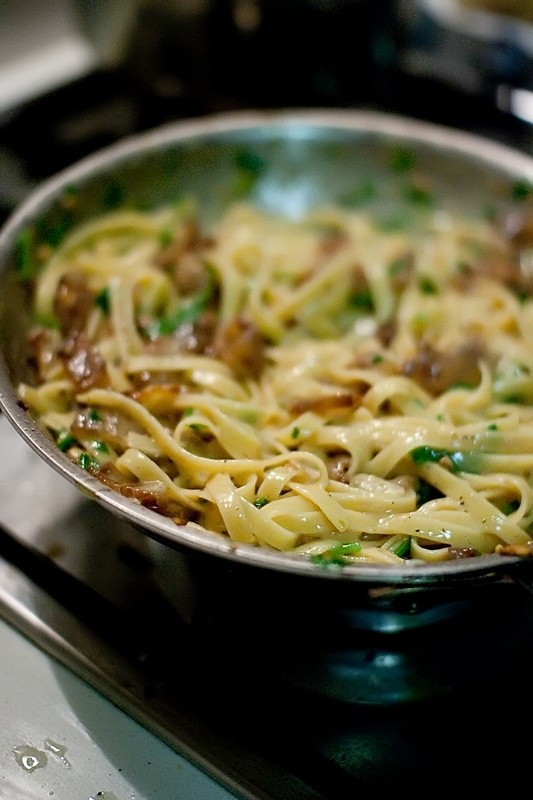 What you’re making is a very simple sauce where the egg cooks just enough from the heat of the pasta to bind it all together with a lovely creamy texture. Add a little of the pasta water if you need to get some more movement happening. Toss it all together well, add the handful of parsley and a sizeable portion of fresh cracked pepper to give it the bite it needs, a little salt to taste, and that my friends, is that. No cream, no mushroom, no white wine… Just some very basic ingredients combining together to make a very beautiful result.